When it comes to UPS battery testing there are two schools of thought. Do you go with impedance testers or conductance testers. Impedance testers tell you if a battery has failed. Conductance testers measure the health of a battery. Given these two simple definitions, impedance testers can give you a quick ‘fail/pass’ indication and conductance battery testers and on-going analysis as a battery ages. Conductance is the ability of the battery to generate energy. Trending the results from the use of a hand-held battery tester can provide a timeline-based indication of the state of health of an individual battery. This has a number of advantages, not least of which is the ability to plan battery replacement before they reach their end of life and become a danger to the critical power installation. When measuring conductance, Mhos or Siemens are used as the unit of measure. A poorly executed conductance test of the UPS battery; caused by poor contact with the battery lead terminal. Stronger batteries within the battery string supporting the discharge load (a known phenomenon) and compensating for a degraded battery. This can cause a false sense or security in the battery string and the phenomenon may not be repeatable on subsequent tests. Erratic measurements resulting from an abnormally high AC current from the DC charging system. To off-set this the batteries should be tested off-line. All the batteries within the string are degraded and significantly so. As all the batteries are below their rated capacity, the direct correlation to full capacity is lessened. Non of the batteries will make their full-load calculated runtime. The batteries within any UPS system are a critical component and therefore require periodic inspection and testing. Whilst a UPS system will provide automatic battery testing every 24 hours this is a discharge test that places a partial load on the battery. It is a simulated test that can only provide indication as to the health of the overall battery set. At EcoPowerSupplies we supply hand-held battery testers and fixed battery monitoring systems for UPS systems. We also provide a battery testing, replacement and disposal service. Our products and services help critical power users to ensure their batteries are healthy, to extend their working lives and allow for planned battery replacement during the lifetime of an installation. 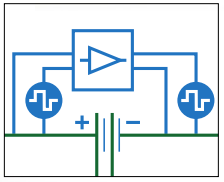 Download this Conductance Battery Testing datasheet for more information.